Our Dacia radio codes are available 24 hours a day 7 days a week. We guarantee our radio decodes work, and its totally FREE! How To Take Out Your RadioIt is quite simple to remove your Dacia radio. You will need a set of radio release keys (PC5-83). These are inexpensive and are around £3 – £5, you can obtain them from a local car audio shop or Halfords. 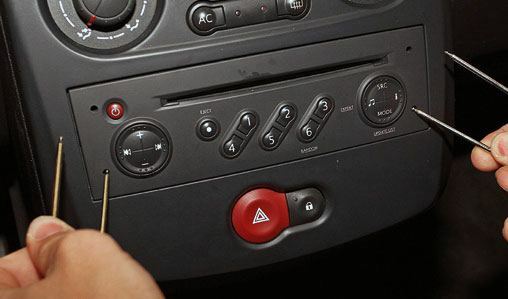 Once you have the radio release keys, push them into the 4 holes in each corner of the radio (See image), apply a little pressure and the radio will release from the dashboard. The radios label will be located on the radio’s casing. 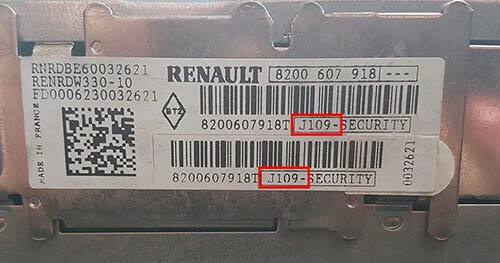 How To Find Your Dacia Radio Serial.The Dacia radio serial is a letter followed by 3 digits for example N123. This is sometimes called the Security Code. This may be part of a larger serial/barcode number starting with 8200/7700/2811. An example of this would be 8200607918TJ109. Please see images below for reference. Switch on the CD or cassette player. The display should show 0 0 0 0. Press and hold 6 to activate the unit. Rotate the thumbwheel for the 1st digit of the code. Then press the bottom button to move on. Rotate the thumbwheel for the 2nd digit of the code. Rotate the thumbwheel for the 3rd digit of the code. Rotate the thumbwheel for the 4th digit of the code. Then press & hold the bottom button button to activate.